In 1634 the order of the Paulaner monks began brewing beer in the Au, thereby laying the foundation stone for today's Paulaner brewery. 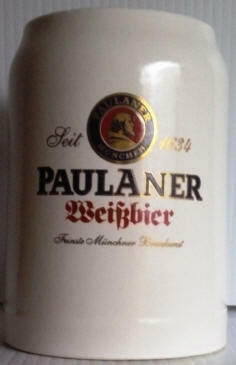 Paulaner has now been producing the best of beers for 375 years and is considered for the best of brewing in Munich. The Bavarian Purity Law of 1516 puts an end to "experimenting". The ingredients permitted in beer were specified and the importance of optimizing the process was brought to the fore. The Bavarian Purity Law is the oldest food law whereby Duke Wilhelm IV of Bavaria passed a law which stipulated that only barley, hops, water and yeast may be used to brew beer. Brother Barnabas, who managed the Paulaner brewery from 1773. The Holy Father of Beer and his artistry, showed in the "Salvator". This double bock which filled one up and probably made one a little tipsy, is drunk throughout the world today. It's characteristics are strong and dark, not too sweet, full-bodied, malty and unique. The worldwide reputation of the Paulaner brewery began with the export of Salvator to Greece, the Czech Republic and Italy at the beginning of the 19th century. New eras are dawning. With the discovery of the yeast cell and invention of the refrigerator in the 19th century came "modernity", characterized by a number of varieties, high quality standards and globalization. In 2010, Paulaner sold a total of 2.1 million hectoliters of beer and exported to around 70 countries. More than 670 employees work on the Nockherberg.